As most of you know, we raise goats, chickens, donkeys, and rabbits here on our little homestead. During the summer, our animals forage and graze around for food and we supplement it with grains and sunflower seeds when need be. 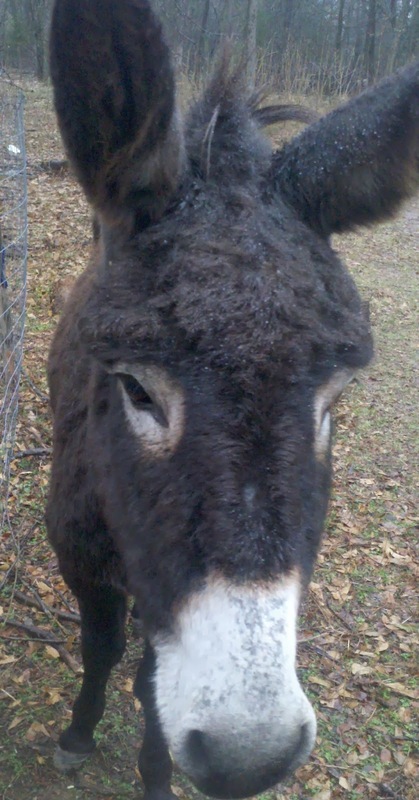 In the winter, we used to have to buy a LOT of feed and hay to sustain our animals through the winter. It quickly becomes quite costly. A few months back we decided that we would look into growing fodder for the animals. We read all we could and decided it was the right path for us. We have been doing it ever since and we are HOOKED! 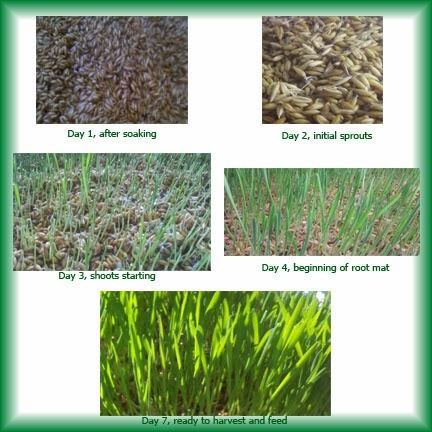 Growing fodder is easy, cheap and takes up a minimal amount of space. How cheap is it? Well, a 50 lb. bag of grain will grow into 300 lbs. of fodder. Yes, you read that right. 50 lb. becomes 300 lbs. You save money and your animals will LOVE it. They go crazy when they see us coming with it. When you decide to grow fodder, you have a variety of grains to choose from. The most popular that are used are barley, oats, or alfalfa. I know people have also used corn and wheat with success too. One note, if you buy oats, just buy whole oats. Crimped or rolled oats will NOT work. Just go to your local feed store to buy the grains. 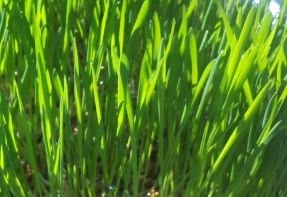 Most people start off with barley because it is the easiest to grow. 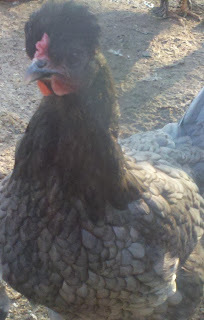 We started out with oats because our local feed store does not carry barley. We have grown alfalfa, oats and barley now and they all do fine. Barley does grow the quickest and thickest but our animals seem to prefer the oats. We grow oats for 2 weeks, then switch to barley for a week, then to alfalfa and repeat the cycle. Do what works best for you and your animals. 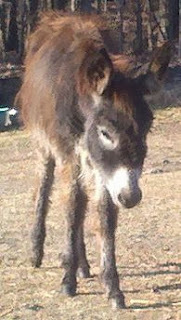 Oats are really good for goats and donkeys digestion. 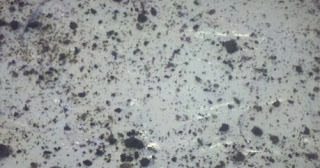 It has great rumen fermentation and is a rich source of protein and it is high in fiber. 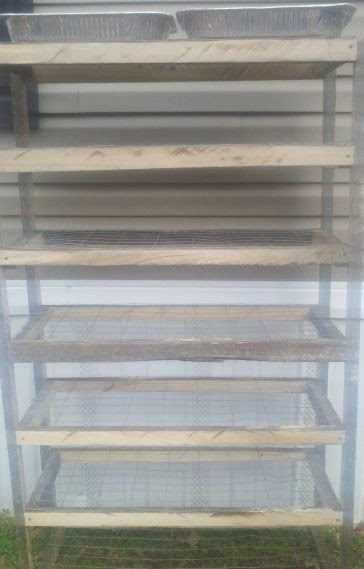 My husband built my shelves out of scrap lumber and welded wire we had laying around. 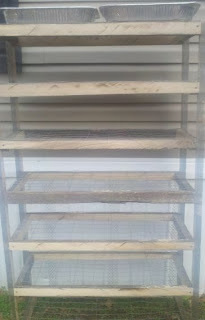 The shelf my hubby made for our fodder system. The trays I purchased from a dollar store. They are just cheap, aluminum roasting pans that you usually use and throw away. The size I bought are 15 1/2" x 12" x 2 1/2". We purchased 14 of these because I like to "harvest" two a day to feed the animals. Hubby drilled a lot of holes in each pan and I was ready to start. On the first day, soak your grains in a bucket of water for 8-12 hours. Cover the grains with about 2" of water. I generally soak mine right before I go to sleep so they are ready when I am the next day. On the second day, rinse the seeds well and then rinse them some more. Now, pour the rinsed grains into your tray(s) and place on the top shelf. You want the grains to cover the bottom of the tray but be no more than 1/2" deep. Again, I "harvest" two trays a day so I have 14 trays with 2 trays for each one of my 7 shelves. Be sure to soak seeds for tomorrow. Remember, to have fodder every day, you must start a new batch soaking every day. It takes a week (for barley) or 10 days (for oats and alfalfa) to begin with but the nutritional value of fodder is so much greater than grain alone. You can "harvest" it at any time but I do mine anywhere from 7-10 days depending on the grain I am growing. By this point, the greens are about 6"-8" tall and there is a nice root mat also. The fodder is easy to work with at this point also. 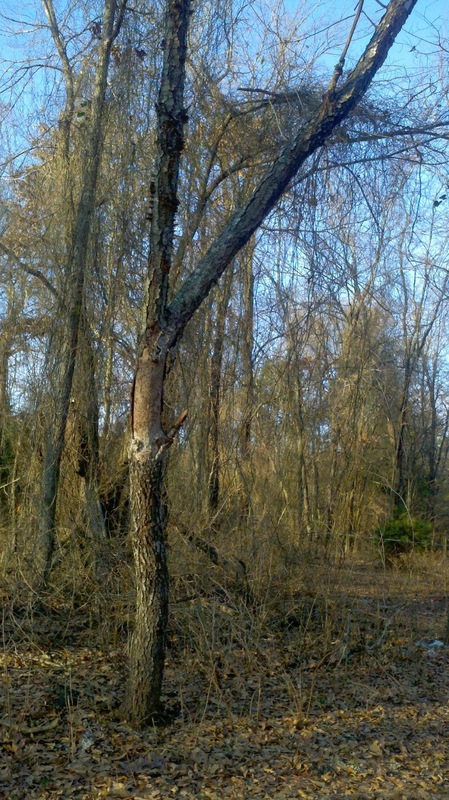 Just pick it up in one big piece or tear it up and feed the animals. The animals will be almost salivating when they see you coming. How they enjoy the seeds, greens, and roots so much more than just plain grains and the digestibility is so much better that they eat less too. Another bonus of fodder is it takes no fertilizer, no soil, no special knowledge. That's right. It only uses water and sunlight to grow. Amazing! With winter time, we place 4' plant lights on each end of our shelves to help the fodder grow better. We have had great success with this method. Isn't this oat fodder beautiful?! 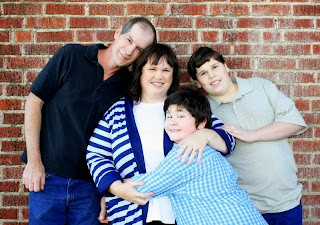 Two thousand and thirteen has been a great year for my blog and all of it social media connections. On Facebook, we reached 5000 fans and the blog itself has had visits from over 134 different countries this year! Amazing, isn't it?! And this post is my 200th post of the blog so lots of milestones are being made or met. Here are some Top 10 lists from 2013. What was your favorite post of mine this year? If a post does not look familiar to you, I encourage you to go read it and see why my followers liked it so much. Also, on the top right is a place you can sign up for my posts to come directly to your email so you never miss a post. I encourage you to do so. Chicken a'la King is one of those dishes that I think counts as a comfort food. A food that makes you feel warm & cozy and makes you think of the good ole days. Of course, that just may be me too. Boil the chicken and then shred it or just use canned chicken. Melt the butter in a skillet and cook the green peppers. Stir in the flour, salt & pepper. When it is nice and hot, stir in the milk, broth and crumbled up bouillon cube. Boil for one minute and stir in the pimentos, chives, parsley, mushrooms, chicken and cornstarch. 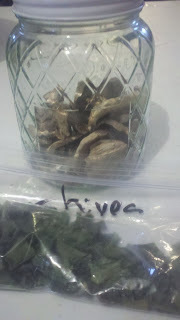 I just used some of my dehydrated mushrooms and chives instead. If the liquid is not hot enough, the cornstarch will not thicken the sauce. Stir well and remove from heat. 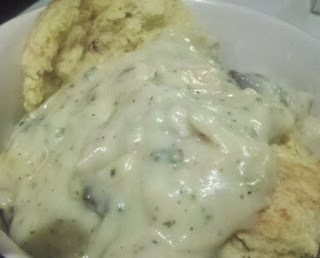 Let it thicken for 5 minutes and then serve over hot biscuits, toast or egg noodles. We prefer to eat it over homemade biscuits. 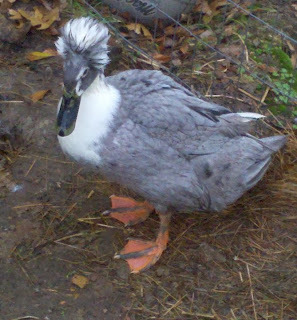 Don't you just love his pompadour and his coloring?! 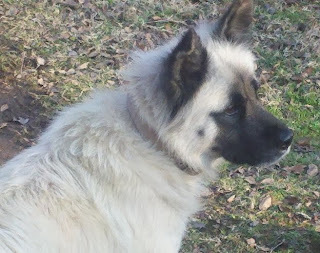 Sheera, our guard dog. We love her so much and she is so protective of our family. She is a mixed breed. 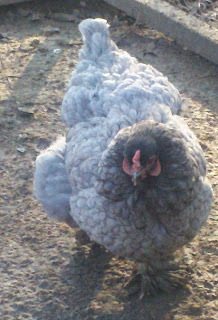 Her father was a Polish rooster and her mother was the blue Cochin. The woods are still pretty in the winter time. I just wanted to take a moment and tell each of you "Merry Christmas". I cannot convey how much each of you mean to me. I pray God blesses you all today and over the span of the next year. 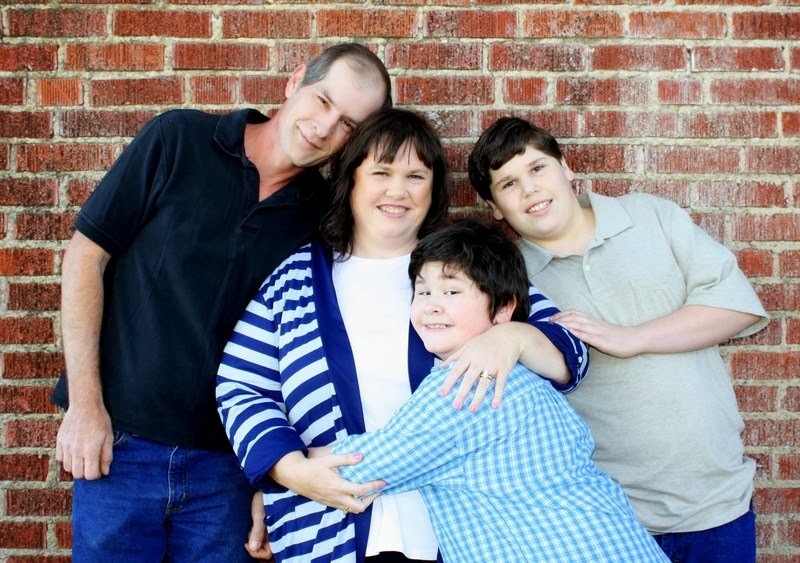 Ron, Melody (me), Ronny, and Bub! 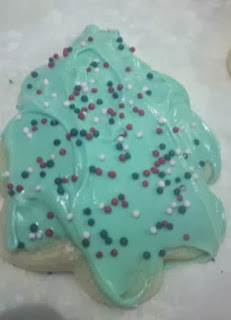 Everyone likes a good sugar cookie and this is the recipe we always use. These turn out really soft and are quite tasty. Sift the baking powder, salt, and flour together and set aside. Cream the butter and sugar together until fluffy and then beat in the eggs, one at a time. Now, blend in the flour mixture. Cover the bowl and put in the refrigerate to chill for a minimum of 2 hours. After the dough is chilled, preheat the oven to 350 degrees. Roll out your dough onto a floured surface about 1/4" thick. If you roll out the dough too thinly, the cookies will be crisp and not soft. 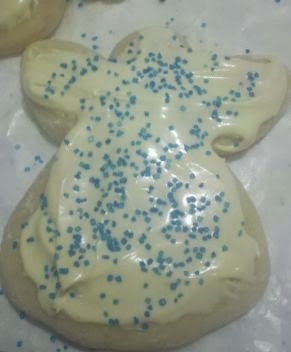 Cut out cookies with cookie cutters. Bake for 8 1/2 minutes. You know they are done when the centers are no longer wet. Do not overcook. Decorate or frost as desired. Mexican wedding cookies are simple to make and are a great light tasting little cookie. You may not know these cookies by name, but once you see them, I'm sure you'll recognize them. Preheat the oven to 350 degrees. Beat the butter, 1/2 c. of the powdered sugar and vanilla together. Add in the flour and walnuts. Shape into 1" balls and place on a cookie sheet and bake for 14 minutes. 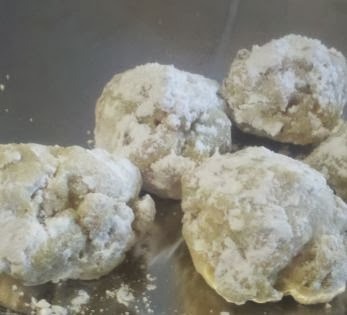 When they are done, roll them in the remainder of the powdered sugar. 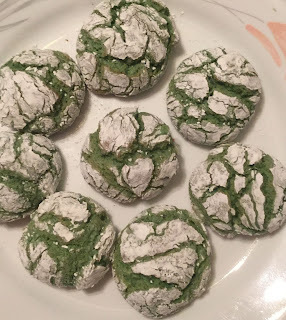 Grinch cookies are colorful and the kids go crazy for them and they taste amazing! Preheat the oven to 375 degrees. In a small bowl, mix the cornstarch and powdered sugar together and then set aside. In a mixing bowl, mix the cake mix, butter, and eggs together until well blended. Stir in the food coloring. I used 12 drops but use how many you want to get the shade of green you desire. Now, drop blobs of the cookie dough into the powdered sugar. It may look like it will not work at this point but just go ahead and plop a big spoonful in and try it. Coat the dough blob well and then place on a cookie sheet. Place them a bit a part because they well spread out. Bake for 8 1/2 minutes. Other cookie recipes I know you will love include: my No Bake Cookie recipe and my Classic Sugar cookie recipe. 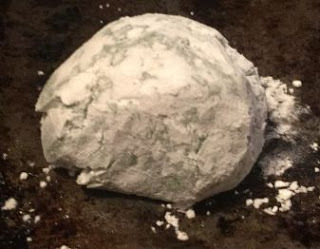 The Dirty snow cake is a kid's favorite. It tastes really good and it looks just like dirty snow. It is generally a hit at Christmas parties. Mix up the cake according to directions but in place of the water use an equal amount of milk; instead of oil, use an equal amount of butter and use one more egg than the recipe calls for. Making these changes makes the cake taste more like you would find in a bakery instead of just a boxed cake taste. Once the mix is blended, stir in the flour, salt, vanilla and lemon juice. Most boxed cake mixes are too sweet and these ingredients help to offset this and again, just makes a better cake. Crush up 1 c. of sandwich cookies and gently fold into the batter. Pour the batter into a cake pan and bake according to the box directions. 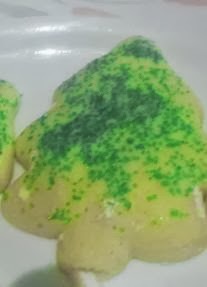 Once the cake is cool, frost it with white frosting and then crumble up some more cookies and sprinkle on top. Another recipe that kids love is my Grinch Cookies! If you love pecan pie, this recipe is for you. 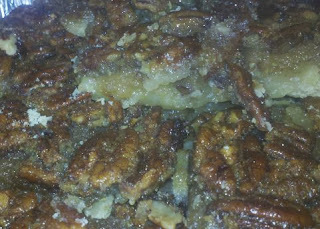 It is not as sweet as a pecan pie but equally as good and serves more. Mix the crust ingredients together and then pat them into a 9" x 13" cake pan. Bake in a preheated oven at 350 degrees for 15 minutes. 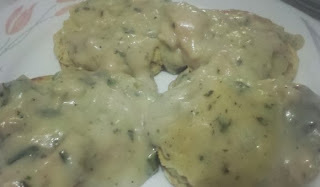 Mix the filling together and then pour over the cooked crust and bake at 350 degrees for 30 minutes. Remove from heat, let cool and then cut into bars. I make an excellent Chocolate Chip Cookie Bars too! Check it out! Cheerio candy is a great and easy candy to make for Christmas time or anytime. It is a family favorite. 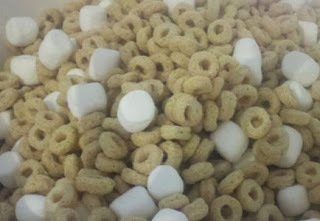 In a large bowl, pour in the cereal and marshmallows. Measure up the peanut butter and set aside. 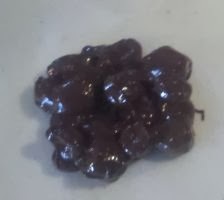 Melt the chocolate chips in a clean, DRY bowl in the microwave in 30 second intervals. Stir every 30 seconds until they are completely melted. As soon as they are ready, immediately stir in the peanut butter. When blended together, pour over the cereal mixture and stir well. Drop by spoonfuls onto wax paper and let set. Another good candy recipe I have shared are my Homemade Reeses! 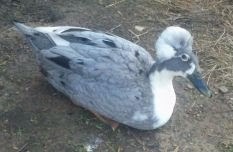 I just went out visiting the animals on and around our farm today and wanted to share with you what I saw. 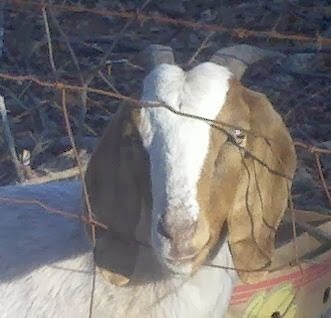 This is our nanny Boer goat. 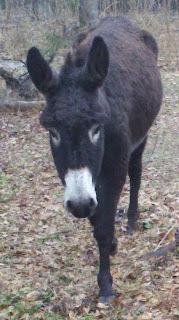 Minnie and Jasper (our resident donkeys) coming to greet me. Minnie is Jasper's momma. Mozart (I'm sure you see why he has that name). 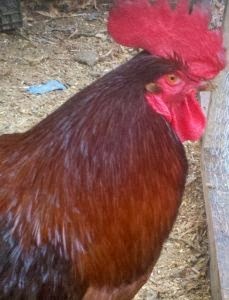 Our big Rhode Island Red rooster. 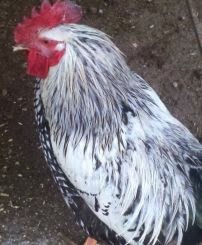 Our Silver Laced Wyandotte rooster. 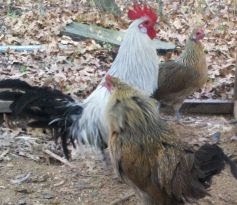 This is our Silver laced Phoenix and his mates that are golden laced Phoenix breed. Sheera, our resident guard dog. Thank you for letting us share our life on the farm and a few of the animals that live here with us. 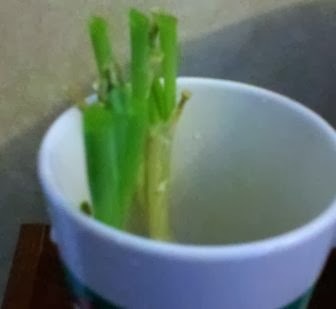 I am sure a lot of you have heard about growing or regrowing green onions. I have been doing this for about a year and will never buy them again. 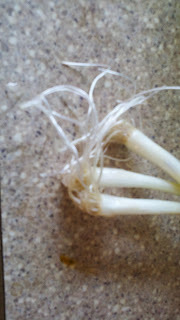 To begin with, grow some green onions in your garden or buy a small bunch from your grocery store. Use the green part as you normally would but when you are done, just put the white part into a small container with a little bit of water and place it on your windowsill. The part you place in the water. 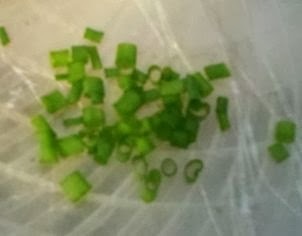 The green onions after I cut them. Now just wait for the greens to grow out again and then cut off the greens and repeat. I cut a good deal off every 3-4 days. 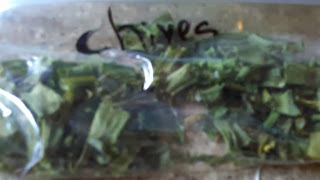 I just use scissors to do it and then I place the chives into my dehydrator and dry them out for future use. Here they are just a few days later. Cutting them up is quick and easy with scissors. In the dehydrator about to be dried. They go great on baked potatoes or you can throw them into a soup or casserole. Just one more way to save money. 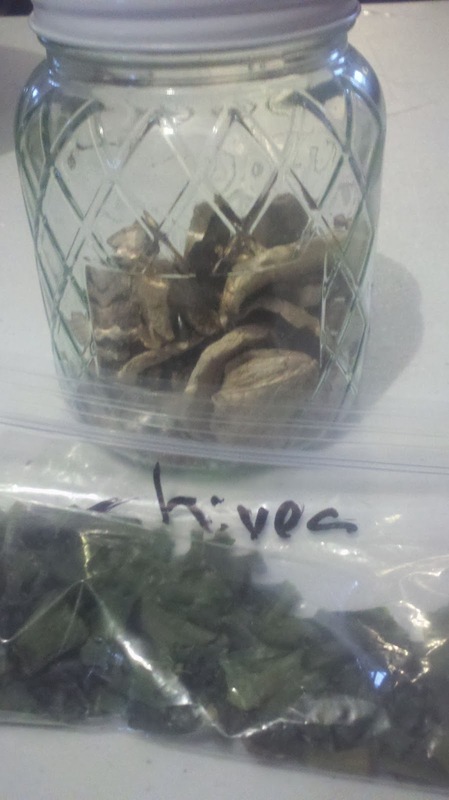 I store in a baggie for future use. Mix the flour, salt and pepper together in a small bowl. 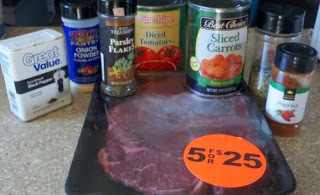 Dredge the steaks through the flour mixture and lightly brown the sides in a skillet with a bit of oil. 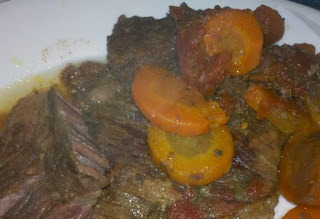 Once lightly browned, put the steaks into the crock pot. In a large bowl, mix the rest of the ingredients together. Do NOT drain the tomatoes. Once the ingredients are mixed well, pour onto the steaks. Cook on high for 6 hours or on low for 10 hours. These turn out super tender and flavorful. If you like cooking meals in the crock pot, check these out too: Complete Chicken Dinner in the Crock Pot and Turkey Breast Cooked in the Crock Pot.